Queen Mary 2 bids farewell to New York and heads for Southampton on her milestone 200th crossing; to mark the beginning of the historic voyage from New York, the world’s most iconic ship performed a sail-by of the world’s iconic statue atop Liberty Island, the Statue of Liberty. 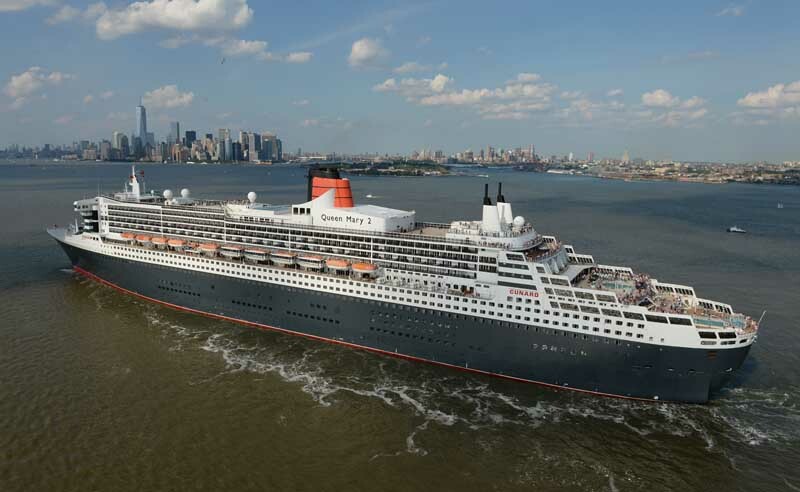 Queen Mary 2 is the largest, longest, tallest, widest and most expensive liner ever built. Today, she is the only ocean liner in service and is the fastest passenger ship in the world. Since entering service in 2004 she has cemented her place in maritime history as the most famous passenger ship afloat today. In the course of Queen Mary 2’s 200 Atlantic crossings, Cunard estimates that half a million passengers have consumed 8.4 million cups of tea, 980,000 scones, 481,000 bottles of champagne, 644,000 eggs and 960,000 litres of milk. In total, 22.4 million meals have been served with over 600,000 nautical miles sailed. And these figures do not take into account consumption on her annual World Cruise or sailings to the Canaries, Fjords, Iceland, the Low Countries, around Britain, up to Montreal and Quebec in Canada, and among the islands of the Caribbean.